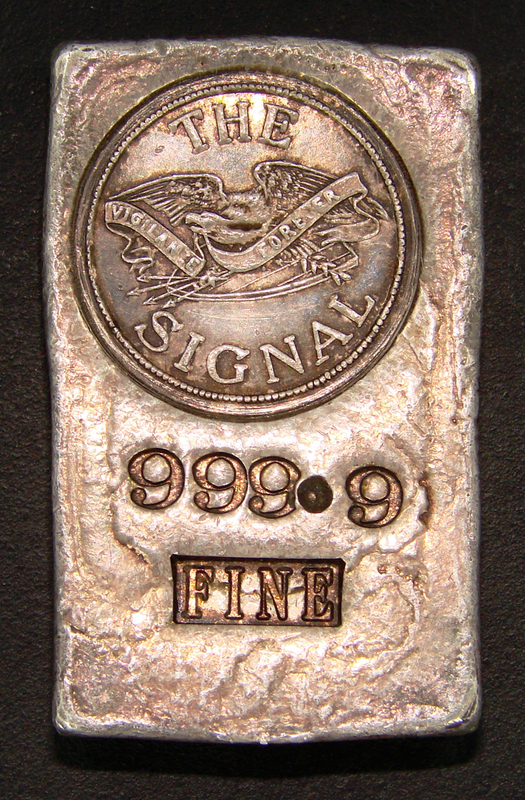 5.04-ounce silver ingot, "The Signal," made by Scott Newhall, circa 1973. One of approximately 50 issued. Scott Newhall didn't do anything half-way, be it editorializing or pursuing his hobbies. He was a big-time collector of coins (and artwork, cars and more). He was particularly attracted to silver world coins, especially from one of his favorite vacation spots, Mexico. On occasion, he even made his own silver ingots as mementos of various ventures, including his Newhall Signal newspaper. It was an art form he'd learned while working for the San Francisco Chronicle. He started there in 1934 as a summer replacement photographer and worked his way up to executive editor from 1952-71. The Chronicle building sat (and still sits) directly across Mission Street from the old San Francisco Mint — one of the few buildings to survive the 1906 earthquake and fire. Coins were struck there from 1874 to 1937. "I went up through the Mint one time quite early on and watched them pour some silver and gold ingots — you know, five-ounce silver bars or 10-ounce gold bars," Newhall told Suzanne B. Riess, who interviewed him in 1988-89 on behalf of the Bancroft Library at the University of California, Berkeley, where he had studied in the early 1930s. "I knew how to pour silver and gold bars," Newhall said. "It's a fascinating business. If one realizes that the basis of all commerce and cultural concourse is money, mostly the precious metals, one becomes fascinated with it." To what must have been Newhall's dismay, in 1963-64, when the spot price of silver reached and ultimately surpassed the nominal value of U.S. coins, the Treasury decided to suspend the issue of 90-percent silver dimes, quarters and half dollars beginning in 1965 and replace them with a copper-nickel "sandwich" composition. (Silver dollar coins were last minted in 1935.) Half dollar coins were reduced to 40-percent silver clad until 1971 when they, too, became fiat money. Around the same time this was happening, Scott and his wife, Ruth Waldo Newhall, bought The Newhall Signal (1963) and moved into the Warring Mansion in Piru, which they would purchase in 1968. There's an axiom in numismatics called Gresham's law: Bad money drives out good. Scott Newhall, like millions of other Americans, made it so by withdrawing the 90-percent silver coinage from circulation. The Signal's news racks provided Scott with a cache of semiprecious metal. He instructed circulation department staffers to sift through the coins and pull out those dated 1964 and earlier. Over a period of years, he melted them down and cast them into small, blank silver bars. Around 1973, Scott realized he owned another supply of silver in the form of old, silver-bearing page negatives (used to burn the offset plates for the printing press). He hauled them out of storage and brought them to a local amateur silver recycler who took them to the Mojave Desert, burned them, recovered the raw silver from the ashes, and split the resulting haul 50-50. Scott took his share, now in the form of small granules, to his shop in the basement of the Piru Mansion. There, using an acid process, he refined it into .9999-fine (essentially pure) silver. With torches and crucibles ablaze, he cast more blank silver bars and then decided to produce a limited issue of 50 commemorative bars for friends of The Signal. He crafted a die with The Signal's logotype and eagle mascot and pressed it into silver ingots weighing approximately 5 troy ounces. Because each was hand-made, no two are alike; the one depicted here is 5.04 ounces, while another is known to weigh 5.56 ounces. A staffer in the newspaper's circulation department stitched together small, gold-and-red flannel bags for each ingot, which was accompanied by a letter that told a glamorized history of the bar and its approximate value. From 1973-78 the rare souvenirs were presented in person to special friends and major advertisers of The Signal, and the Newhall family kept a record of each ingot owner. LW2424: 9600 dpi jpeg courtesy of silver ingot collector Ken Conaway, the owner of this example in 2013.